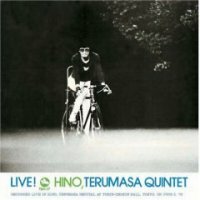 Born in 1942, trumpeter Terumasa Hino has been the leader of Japanese jazz for many decades, and one of the most internationally recognized among Japanese jazz musicians. His technique is amazing and his lyrical and emotional performance is something to behold. Recorded live in concert at Tokyo Yubin Chokin Hall on June 2, 1973, Hino and his quintet clearly showed that they were steeped in the "free" mode of operation, but their performance is engaging and does not leave the audience behind. Wild and unpredictable improvisations coexist with lyrical and rhythmic playing. A brilliant performance with many instances of amazing interplay. Recorded live in concert at Tokyo Yubin Chokin Hall on June 2, 1973. Blu-spec CD is compatible with all regular CD players. Paper sleeve special limited edition.